For two years he remained in the orphanage. During that period the seed of the religious vocation which God had planted in his heart, began to manifest itself and soon developed rapidly. For the first time, and in presence of his brothers, he gave utterance to the phrase, “I will be a priest”. There were early indications of how God’s grace was preparing him for a totally dedicated life: a reverent sense of purity and modesty, a serious composure, recollection, patience, devotion, and piety. The seed of God was sprouting in fertile soil. The tender plant was soon ready to be transplanted to the garden of the religious life in the Congregation of the “Priests of the Sacred Heart”. The object of the Congregation of the Priests of the Sacred Heart, founded by Father Dehon in 1877, is to render to the Sacred Heart of Our Lord the cult of love and reparation which he had requested from St. Margaret Mary Alacoque. The exercises of piety in the Congregation and all its works are directed towards the fulfillment of this end: daily adoration of the Blessed Sacrament, Mass and Communion of Reparation, sanctification of the First Friday and the practice of the Holy Hour. The apostolate to which these priests dedicate themselves is the instruction of youth, preaching, missions for the people, spiritual assistance for emigrants, the evangelization of the infidels. After 80 years of existence the Congregation is spreads over the world and contributes immensely to the salvation of souls. 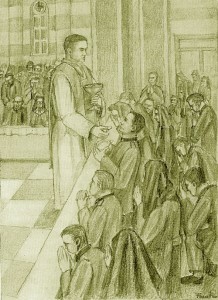 Vincent’s ideal was to be a priest, a good priest. When he was questioned by a Father concerning the sincerity of his vocation, he replied quietly and serenely, “ With the help of God, I desire to become a holy priest”. He already understood that the call to priesthood was inseparably linked with a call to sanctity. 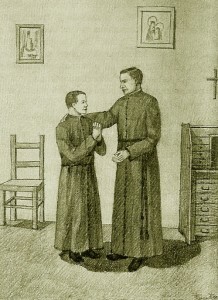 Through the encourage and direction of one of his relatives he was providentially led towards the Congregation of the Priests of the Sacred Heart. The ideals of the Congregation attracted him irresistibly and he asked to be accepted as a member. He was accepted and was admitted to the Juniorate of the Congregation at Albino in the province of Bergamo. At first he found himself disheartened- perhaps on account of the distance from his home – more than a thousand kilometers- and embarrassed by his southern accent which is not too pleasant to the people of northern regions. He soon settled down however, and soon revealed his happy disposition. Being humble and peaceful, he was kind toward his companions. He accepted as peacemaker and took the newcomers under his care and initiated them into the life of the Juniorate cheering them up with amusing stories. The Rector of the Juniorate at that time, Fr. Joseph Goebels, said of him: “I can affirm that from the beginning of his days at Albino, Vincent Gallo was a model of piety, of charity, obedience and application to study”. This was Vincent in embryo. In religious Congregations it is usual to pass from one house to another. Anthony was first at Guastalla, then at Bologna where he completed his studies. With a tenacious will he succeeded well in overcoming the difficulties that he had encountered. He applied himself to his studies assiduously and even renounced the usual periods of recreation. These sacrifices combined with the cold and damp northern climate to which he was accustomed made serious inroads on his health. These factors brought on the malady which led eventually to his death. The tide of war which raged from May 1915 on the Italian front brought him to serve his country under arms. First, at the end of June 1917, he was exempted from service after only two months on account of his poor health, under arms again in May of 1918, he proved an exemplary soldier, always preserving his spirit of deep and sincere piety. On Christmas night of 1918, at the front, he walked for two and a half hours in snow and ice, so as to be able to receive Holy Communion. The hardships of military life only tended to strengthen his spirit and to increase his merit. 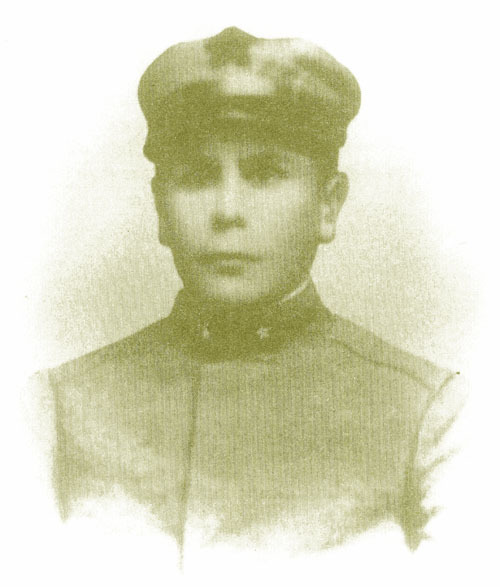 Having served his country he returned to Bologna on June 8th, 1918 in order to receive the Religious habit. 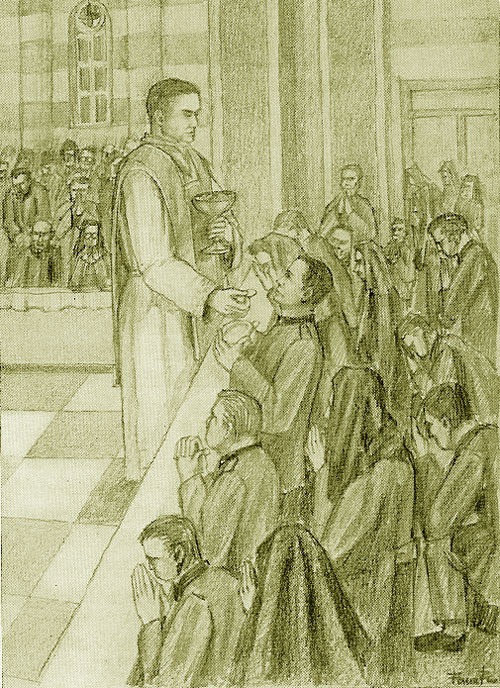 He began his novitiate in Abissola, in the province of Savona, in October 1919 and prepared to receive the habit after a retreat. Great was his joy when clothed with the habit in the presence of his co-religious in their pretty chapel, he felt himself one of their number. He received the scapular of the Sacred Heart with the blessed cincture. Taking a name in Religion he chose Anthony in memory of his father. During the novitiate period – a year of prayer, meditation and mortification – he gave himself up to the reform of his spirit and the acquisition of the perfection of religious life. The Master of Novices, Reverend P. Luigi Duborgel, attests that, “during his Novitiate, Anthony attracted attention of his superiors by being humble and observant of the rules and by devoutly living that interior life which is so advantageous for the advancing in holiness. He was really esteemed by everyone”. Finally the dream which he had so long cherished with love and fervour became a reality – he consecrated himself definitely to God by his temporary Profession, by which he became a member of the Congregation of the Priests of the Sacred Heart.